HF: The following has been adapted from the company website: In 1928 Yin Chi Chung founded his hand sewing needle factory in Tsingtao, China. This was the first such company in China. 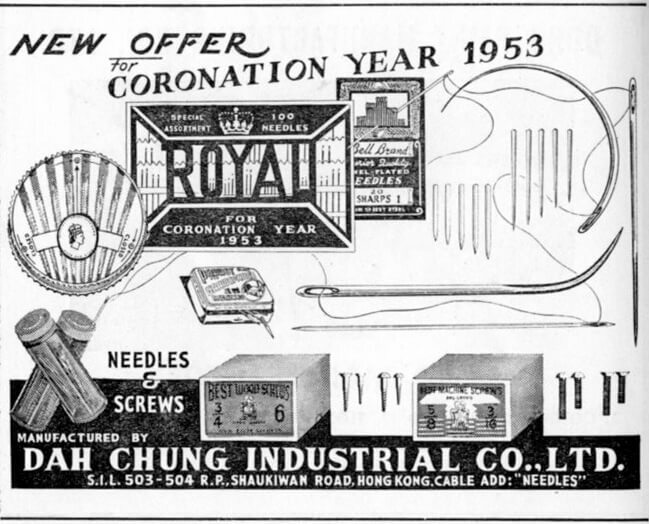 By 1935 the company had attracted attention from other major suppliers of hand sewing needles in the world. Representatives of the German company William Prym GmbH came to visit the plant in May of that year. William Prym remains the largest manufacturer of needles in the world today. 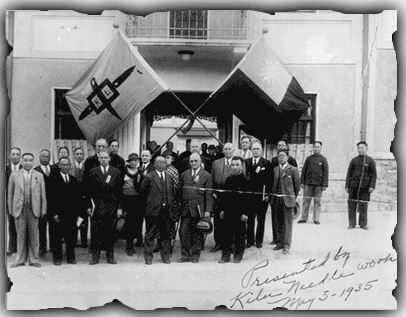 The photo appears to have been presented by Kiln Needle Work, and the left hand flag is inscribed with the letters KL. In 1936 the Shanghai Needle Factory and office was founded. In 1938 Mr. Yin moved to Hong Kong with his family and some of his fellow workers and set up Dah Chung Industrial Co. Ltd. in Shaukiwan, Hong Kong. The factory employed more than 1000 workers and slowly developed an export market over the years. In 1946 [?] both the Tsingtao and Shanghai factories became state owned. They remain the two largest needle manufacturers in China. 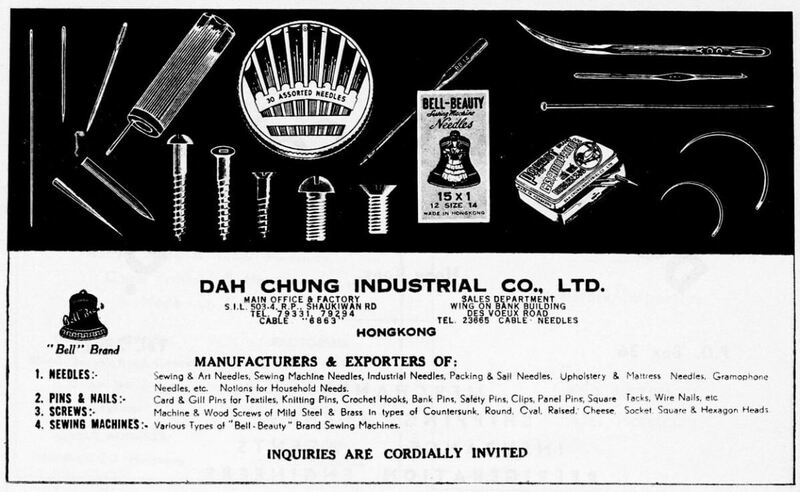 Many thanks to IDJ for supplying these two Dah Chung adverts. The 1970s saw Dah Chung set up an office and production in Taichung, Taiwan. In the 1980s Dah Chung jointly developed its existing land with Cheung Kong Holdings Ltd to provide 416 apartment units in Shaukiwan. The main production line was moved to Shenzhen. During the same period joint venture production companies were set up in Beijing, Tsingtao and Wuxi. How many people was there to make needles! Nowadays we get it easily.